CST Models Titan 22 and CentriX-22 Rimfire Receivers can both be purchased online! 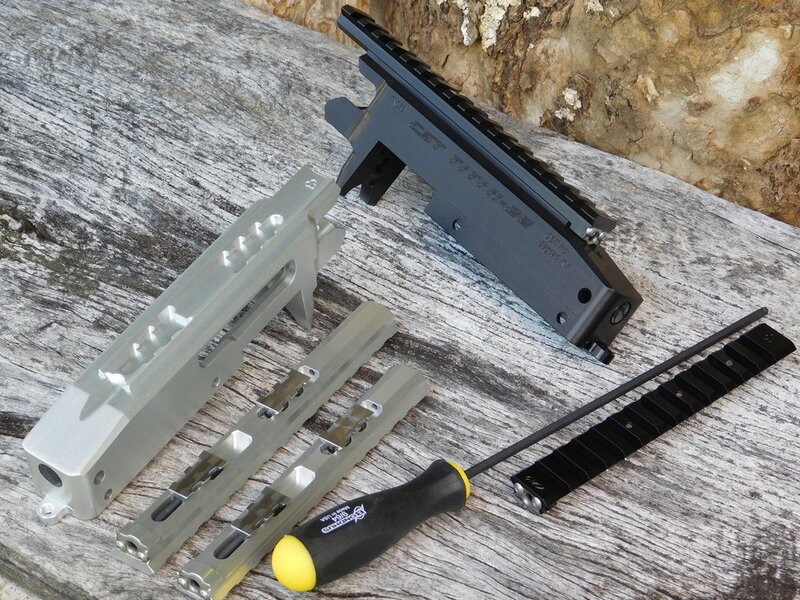 CST Rimfire Receivers are all CNC machined from aerospace grade 6061-T6 aluminum billet to stringent tolerances and protected by hard anodize, (clear or black are available). We pride ourselves in providing the best fit and finish you will find on the market. Every receiver is hand deburred and polished, particularly in the critical bolt channel providing the smoothest operation found anywhere. Drop-in Design is fully compatible with factory and aftermarket stocks, barrels, trigger assemblies, bolts, barrel clamps and other 10/22* components. CST Rimfire Receivers also feature a removable cap to allow barrel cleaning from the rear, proper clearance built in for the Grand Master Trigger spring assisted magazine release, and a removable rear threaded tab to allow the addition of a rear action screw. The ability to remove the threaded rear tab allows drop-in installation of CST Rimfire Receivers into any 10/22* stocks to be added later if desired. The CST CentriX-22 Rimfire Receiver features a reinforced rear tang built into the integral picatinny rail for extra rigidity while minimizing additional weight. Extra surfaces are created to flow into the stock for an elegant look. Features of the new CST Titan 22 semi-automatic receiver include the patented R.R.A.C Rail System, (Rigid, Rapid Attachment and Configuration), a means to quickly attach different configured rails, (flat or extended 20 MOA rails are available), without the need to first remove the sighting instrument from the rail. Using the CST R.R.A.C. Rail System, zero of sights is maintained and has been best described as a "quick-detach that actually works". Upon request, colors of R.R.A.C. Rails can be mixed up for a distinctive look. All CST Rimfire Receivers include cross-pins free of charge. To simplify installation of the rear action screw, Rear Pillar Sets are available. The threaded Rear Tab is firmly located in the receiver using two dowel pins and with special bedding in the stock provides a rear action screw fastened from the bottom. Short (standard) and long Rear Tabs are available for the best look in the pistol-grip curvature of the stock. To avoid any required bedding, the threaded Rear Tab can simply be removed for a drop-in installation of the receiver into the stock. Both the CST Titan 22 and CentriX-22 receivers are available in "kit" form, allowing the bundling of parts to best suit your next build. Receivers can be purchased with the Power Match Bolt and Extended Charging Handle included, or complete "everything but the stock and barrel kits" are also available. Complete kits feature the Grand Master Trigger Assembly with a special version CST 2nd Gen Auto Bolt Stop pre-installed, making it the only "10/22"* with a last shot bolt hold open feature right out of the box. Mix-matching colors of the Grand Master Trigger Assembly to the receiver is available for that perfect custom look. "Just wanted to send my thanks for the support I got from you this year. As you can see from the picture, I won both the Kentucky and National ABRA No.1 ranking this year for autoloading .22 Benchrest rifles. I used three different CST actions of your manufacture and all performed flawlessly. I enjoyed talking to you early in the year concerning design. I believe your combination of stiffness and rear attachment is the best in the business. Thanks!" COMING SOON: CST CentriX-22 Rimfire Receiver Full-Kit (receiver with Power Match Bolt and Power Extended Bolt Handle; Barrel Clamp-Set; Action Screw (front); and NEW Power Master Polymer Trigger Assembly including Spring-Assist Mag-Eject and with CST 2nd Gen Auto Bolt Stop pre-installed; : WAITING ON NEW POWER CUSTOM POLYMER TRIGGER ASSEMBLIES, COMING SOON!